This is colorful set of canisters for the dollhouse kitchen. The lids remove. 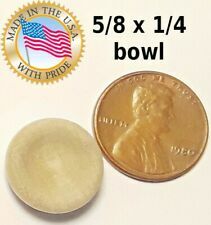 Wonderful treasure to add to your dollhouse! 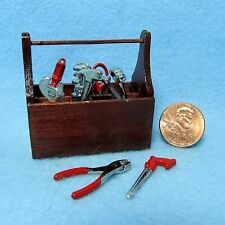 Perfect for the handy man in your dollhouse. Tool Box & Tools. Tool box is wood. Perfect for any dollhouse kitchen. Wonderful treasure to add to your dollhouse! Knife Block. Dollys Gallery. 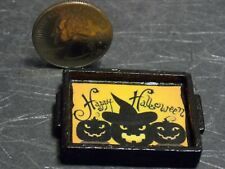 Dollhouse Miniature Halloween Serving Tray. Tray is made of wood with a Black Finish. Perfect accessory for your dollhouse kitchen. Wonderful treasure to add to your dollhouse! Canister Set. Dollys Gallery. by Bodo Hennig in Germany. This is made in 1:10 scale. Set of 6 pieces. This is a lovely dollhouse (1/12 scale) washer and dryer set from Pitty Pat Miniatures. They are handmade. The doors open, and you could put a little clothing item or two inside. Non-working. They would look great in any dollhouse or roombox scene. The washer is 2.25 inches wide, by 3 and 3/8ths inches tall, by 2 inches deep. The dryer is 2 and 5/8ths inches wide, by 3 and 3/8ths inches tall, by 2 inches deep. The fit nicely side by side. Reutter Porcelain Doll House Miniature Backyard Barbecue Tools Set Barbecue set includes all items pictured. Last one. Retired. Very realistic. Scale is 1:12. Made by the Reutter Porzellan Company of Germany, they are known for the superior quality of their porcelain. Not meant for small children. Save on shipping by combining purchases. Check out my other items!. Wonderful treasure to add to your dollhouse! Perfect accessory for your dollhouse kitchen. Canister Set. Wonderful treasure to add to your dollhouse! Perfect accessory for your dollhouse kitchen. Cutting Board & Knife. Dollhouse Miniature Bathroom Supplies by Bodo Hennig of Germany Includes a roll of bathroom tissue and wooden holder and a toilet brush and wood holder. New in the box. 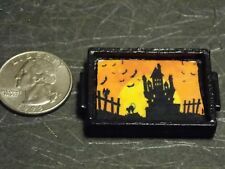 Just perfect for your dollhouse or miniature setting. Very realistic. Scale is 1:10. I pack with care!. About 1 1/2” tall x about 3/4” sq. Dollys Gallery. Dollhouse Miniature Round Cutting Board Set with Cutter. This could be used for a pizza board. Dollys Gallery. Dollhouse Miniature Wooden Mahogany Serving Tray. This is a red dollhouse kitchen clock. It is 1" across in 1:12 scale. I usually have it listed in white also. Dollys Gallery. Dollhouse Miniature Wood Tea Water Pitcher Pot. By Royal Miniatures. Dollys Gallery. 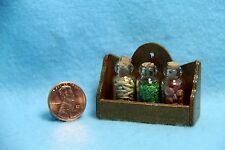 Dollhouse Miniature Wood Lidded Pot. Lid is NOT removable. By Royal Miniatures. Dollys Gallery. Dollhouse Miniature Wood Tea Pot. By Royal Miniatures. LOT OF 9 MINIATURE WOOD MILK CAN CANISTER UNFINISHED(READY TO PAINT) MAY HAVE MINOR WOOD FLAWS. 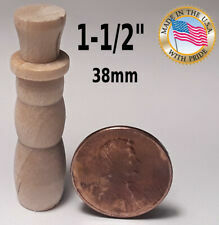 GREAT FOR DOLLHOUSE/BUILDING SETS/TRAIN SETS/CRAFTS OF ALL KINDS. Small butter chrun turning. Finish: Unfinished. Scale: approx 1:24. Centerpiece bowl with 2 pieces of faux fruit. Dollhouse miniature coffee set. A lovely addition to your dollhouse miniature collection. Coffee pot. 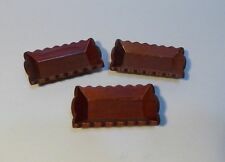 Perfect set of trays for your dollhouse. Wood stained in Mahogany. Serving Tray Set. This is a quality miniature recreation of a shelf in 1:12 doll scale. Miniature Kitchen Wall Shelf, Walnut. 1:12 scale is also known as doll scale. It is commonly used in dollhouses. The 1:12 represents a ratio that is 1/12 the size of a normal object. Perfect for any room in your dollhouse. Wonderful treasure to add to your dollhouse! Wood painted white. Dollys Gallery. Dollhouse Miniature Wood Water Pitcher Pot. By Royal Miniatures. Dollhouse furniture is in new, unused condition. Includes a display cabinet with mirrored back behind the shelves and glass door. Sofa is wood with red "velvet-like" material. These are nice, well made pieces. Dollys Gallery. Dollhouse Miniature Wood Lidded Tea Pot. By Royal Miniatures. A Small Wooden Butter Cask Barrel. this barrel is a part of our wide selection of pub furniture and accessories. This item is a d etailed scale model for adult collector and is not suitable for children under 14.